Duracell powers a fantastical Christmas-morning Star Wars battle of epic proportions in this holiday commercial from Anomaly that breaks Friday nationwide on TV and onlline. A fun watch in its own right, the minute-long spot—which rolls out ahead of the Dec. 17 release of Star War: Episode VII—The Force Awakens—speaks volumes about the Endor-size influence that entertainment franchises exert on the modern concept of imaginative play, and the way brands can tap into that dynamic. 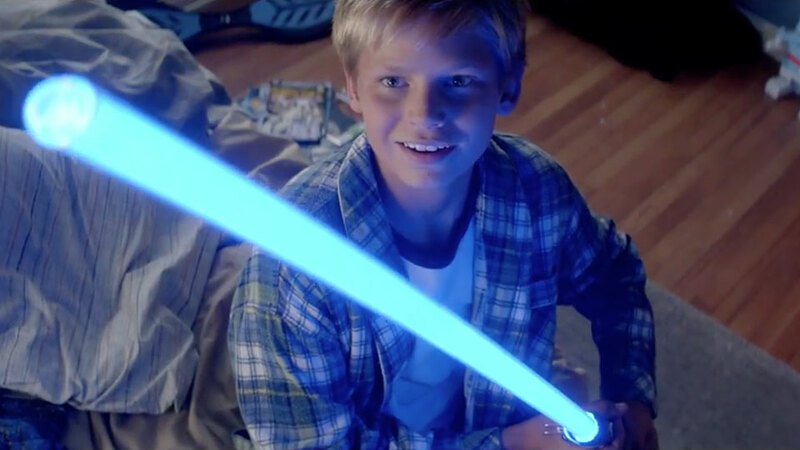 In the ad, a 14-year-old boy and his 9-year-old sister get their Force on in a major way, wielding Duracell-powered lightsabers to fend off an onslaught of Stormtroopers on Yuletide morning at their upper-middle-class home. Their weapons shimmer and sizzle, the halls of the house shudder with fiery explosions, and R2-D2 and C-3PO (the latter voiced by franchise star Anthony Daniels) make a cameo appearance. Ultimately, the action spills out into the snowy backyard, where towering Imperial Walkers loom menacingly in the distance and Star Destroyers and TIE fighters blacken the sky. The visual and audio presentation are especially impressive, as you'd expect, given that Duracell partnered with Disney, Lucasfilm, Industrial Light & Magic and Skywalker Sound to achieve an authentic, exhilarating look and feel. "Everything was very genuine to the Star Wars universe," Seth Jacobs, Anomaly group creative director, tells Adweek. "So much so that our costumes needed to travel from The Force Awakens set in London to Los Angeles, where we were shooting. Then they were watched over by Disney security 24 hours a day for the duration of our shoot." Pacific Rim's Shawn Levy, who directed the Night at the Museum films, does a fine job of integrating the Christmas-morning happenings with the more dynamic Star Wars footage. Of course, the sci-fi thrills are taking place entirely in the kids' imaginations. And that's the whole point, says Duracell marketing director Jeff Jarrett, as the brand, in its first major Star Wars sponsorship, attempts to tie in with the beloved franchise's facility to inspire hours of inventive play. That's not to say, however, that kids are the target here. In fact, Duracell is going after the parents—they are, after all, "the ones who buy batteries," says Jarrett. "Parents grew up with Star Wars," Jarrett adds. "They did that [imaginative play] themselves. Some of them are still doing it," if only at conventions and costume parties or in their daydreams. And Duracell hopes to leverage that deep, generational connection with this campaign, Jarrett says. The full spot will appear on YouTube, Hulu, Facebook, Twitter and various other venues, as well as in cinemas, where the movie-quality effects should really shine. Edits will run on shows such as Dr. Ken, Let's Make a Deal and The Price Is Right. On a deeper level, the push underscores the power that films, TV shows, video games and media in general exert over our collective playtime. I'd wager that everyone's memories of childhood involve entertainment franchises to some extent. And that's not meant as a criticism. They serve as a cultural repository of ideas and images we dip into as needed for inspiration. In the case of long-running favorites like Star Wars, Star Trek and James Bond, this effect is even more pronounced because of the generational pull. "I remember playing with these battery-powered Star Wars toys as a kid, pretending that I was a Jedi and trying to save the galaxy," says Anomaly's Jacobs. "Now that we've been working on this project for the past year, I've been getting my kids into the series, because I wanted to share that experience with them. I went on eBay and bought the same toys that I used to play with, and sure enough, they still work! They're hooked on Star Wars. My son's going as Darth Vader for Halloween. I'll be his loyal Stormtrooper, of course." Whether Duracell's strategy will pay off in a sluggish market for alkaline batteries is anyone's guess. For most folks, one pack of C-cells is pretty much the same as another. That said, this well-executed appeal to nostalgia, and evoking a sense of shared play, might be enough for some parents to remember the Duracell name. One positive indicator for the brand, perhaps, is Star Wars' potent ability to make grown-ups feel like kids again. "C-3PO and R2-D2—you see them on film all the time, but meeting them in real life leaves you kind of starstruck," Jacobs recalls. "We were talking with the C-3PO actor before he got in costume, and it was just a normal conversation, but as soon as he's in the suit and talking to you in character, the only thing you can think is, 'Whoa! C-3PO knows my name!' "